For those who want to drive social change through business, knowledge and education are as essential as in every other sector. Research, reports, news, guides, practical information, university courses: for a normal entrepreneur, these are a given. Open a search tab and browse through endless sources, read any business journal, or attend a management seminar – even online and free of charge: you will be able to obtain a wealth of information that will teach you the business fundamentals. The question is – do social entrepreneurs enjoy the same abundance of knowledge resources? While the basis for all sorts of entrepreneurs are roughly the same, as we have already discussed in the previous two articles on Funding and Consultancy, social entrepreneurs differ in their objectives, legal status, funding hurdles – hence also in their knowledge requirements. In this article, we offer an overview of what sources of knowledge are available in Germany, from research to reports and platforms. When it comes to knowledge sources on social entrepreneurship, especially compared to the previous two sections, the role played by the government is more prominent. Over the past years especially the Federal Ministry for Economic Affairs and Energy (BMWi) has been increasing its attention towards the needs of social entrepreneurs. Universities are stepping up their game and offer courses and events on (or closely related to) social entrepreneurship. The Social Entrepreneurship Academy in Munich, Kiel University and TU Berlin are just some examples. Worth mentioning is also the rise of Massive Open Online Courses, giving anyone worldwide access to free online courses and interactive learning experiences taught by renowned professors and practitioners everywhere. BMWi. In the past few years, the Federal Ministry for Economic Affairs and Energy has published reports on the topic of social entrepreneurship, ranging from a practical guide with tips and pointers to an insight into the challenges and scaling processes for SEs. The website existenzgruender.de offers a number of tools, from financing and support links to procedures and financial and legal status information for SEs. Available for download on this platform are also a sustainable business canvas, reports, and practical guides for SEs. Tbd*. A digital hub that supports those who are determined to make a career out of changing the world. Here people can find a job, hire the right team, discover workshops and courses, locate funding opportunities, connect with mission-driven companies, share best practices, or learn from others who are using their careers to make an impact. SEA. The Social Entrepreneurship Academy is an initiative of Munich’s public universities and specializes in education for societal change. The SEA:mooc “Enabling Entrepreneurs to shape a better world” is open the everyone and designed to cater to future social entrepreneurs, delivering basic knowledge, methods and tools. There are also other great courses for social entrepreneurs like the Changemaker MOOC by the University of Kiel and the Copenhagen Business School course offered on the Coursera platform. 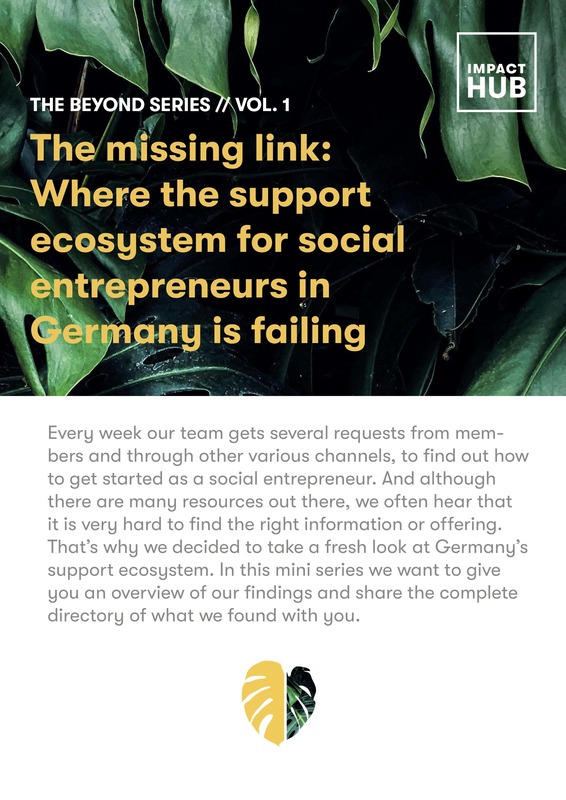 For later stage and especially with regards to investment readiness & social finance, the Social Finance Academy by Germany based Roots for Impact is a great resource. One fact becomes quite obvious to us: There is a real abundance of reports, materials and courses out there – but the vast majority is provided in English. All things considered, even though the quantity of information material in German may not be huge, the quality of what is available is fairly good. This can certainly be considered a valuable asset to paving the way towards a more established social entrepreneurship sector.